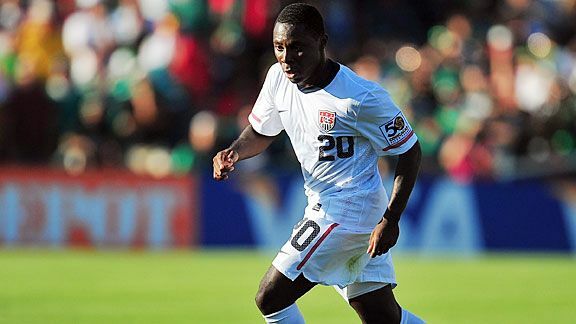 After the 2011 Gold Cup final between the United States and Mexico, Freddy Adu was widely considered the best American player on the field because of his work rate and willingness to take on defenders. For the past four years, he has been out of favor on his pu pu platter of second-tier European club teams. On Saturday, Freddy potentially “got his swag back” and might have earned a role on the national team in the next World Cup qualifying cycle. While this was probably a “feel-good story” because he finally “won over” American soccer fans for his performance on the field instead of for his teen acting skills in Sierra Mist commercials, I’m not sure if this is the prevailing storyline that the American soccer fan would like to take from the Gold Cup. When “your team” loses, you can still find a way to rationalize trends in play that provide hope for the future to maintain your rooting interest. The Gold Cup outcome hurt so much because it was the first taste of the “transitional phase” that our national footballing identity is entering, and besides the Adu anomaly, they didn’t give us much to rationalize. It would have been nice to still feel like Clint Dempsey, Landon Donovan, and Tim Howard might refrain from aging and get it done in 2014. Or maybe we could have seen the core of young defenders prove that they were ready to elevate their level of play to international standards. “At the end of the day,” we lost an important game to Mexico when the foundation of our young, prideful identity is built upon our mental edge over a Mexican team that now has the “right stuff” to compete for a World Cup. Despite all that, you get the feeling that MLS’ recent success might be a cultural microtrend when the vast majority of Gold Cup final attendees were wearing green jerseys. I’m still riding really high from Landon Donovan’s last-minute game winner against Algeria. Maybe I should just chill out until we get our own Chicharito, Messi, or Ronaldo? The emergence of Chicharito on the global soccer stage doesn’t just threaten the upcoming era of the American soccer zeitgeist (sponsored by Nike). His superior skills and warranted hype expose the faults with the American fan’s relationship with our national team and the marketed motivations to anoint a “next great thing.” Freddy Adu is still “the face” of failed American hopes that were overmarketed, and the loss to Mexico coupled with his “solid performance” has sent my fandom into a spiral of darkness. Sort of like a fun college relationship that was only possible because you were young and still living on your parent’s dime, but now that you have grown up and acquired a grim office job, you realize that you were living in a distorted version of reality. But it still meant something. Or did it? I wish I could be more level-headed and attempt to appreciate Adu for what he is and allow him to grow into his new identity without unreasonable expectations. But as the face of the misguided American footballing identity, he might never get the opportunity to be evaluated fairly ever again. We can’t look at him without processing the gap between what he is, and everything we wanted him to be. Similar to LeBron James, his current existence creates a wormhole that leaves us with a series of unanswered questions. Beating Mexico means that we don’t have to think about all of this stuff. When will an American forward score at least 20 goals in the Premier League? I don’t know if I can go thru another Eddie Johnson, Jozy Altidore, or Juan Aguedelo hunting experience. Will we ever find a fast, strong left-footed defender who can get involved in the attack? Bornstein was always doomed. Will the general public finally accept and praise Clint Dempsey as the player who we actually wanted Landon Donovan to be? Maybe Stuart Holden can stay healthy and become the best of Claudio Reyna and John O’Brien. Welcome to another World Cup qualifying cycle, where we overvalue the forward who scores a hat trick against Guadeloupe, get by with slow-but-sturdy defenders and a lack of creativity from our center midfielders, and ultimately assess our team against the only real competition: Mexico. All right, I feel better. But I am NOT giving Freddy Adu another chance again. Carles runs the authentic content farm HIPSTER RUNOFF.